Look at the date... April Fools! In case you didn't realise, you've been had! Most of our email was entirely tongue-in-cheek April Fools, of course. Don't worry, there's no beetroot shortage for the foreseeable future - you're safe for now. And sorry, we don't sell canisters of beetroot... yet! We've decided to poke a little bit of fun at the panic buying of petrol across the country. The stark truth is that fossil fuels are running out. While foolish panic buying may be the cause of today's shortage, tomorrow's shortage will simply be that we have run out of oil. Unless we begin adjusting to life beyond oil, queuing for fuel may become a daily occurence. Time for a truly green transport policy. 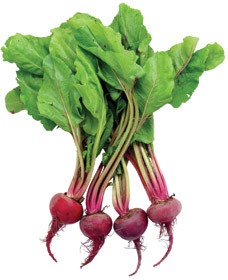 What we're not fooling you about is beetroot juice though, it's actually a proper, bona-fide superfood! Shown in studies at the London School of Medicine to treat high blood pressure and depression, one 150ml glass is also a great way to get one of your recommended 5-a-day portions of fresh fruit and vegetables.